John was raised in Kansas. He received a BS in science from Fort Hays State University and later a MS from Emporia State University. In 1993 he was drawn to the incredible hunting opportunities that the southeast part of the state had to offer and he has lived there every since. For over 20 years his career as a teacher has resulted in many deep connections within the community. John and his wife own a tree farm where he works with private and state foresters to continually increase his knowledge of habitat health, productivity, biodiversity and conservation to help maximize big game production. Driven by his passion for the outdoors, he knows what to look for in land to grow big bucks. If you’re in the market to sell, call John today so he can help you get the fairest price for your property. 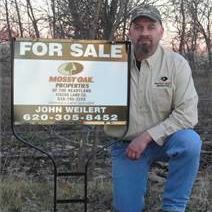 If you’re in the market to buy, let him help connect you to the property of your dreams by using the wealth of resources, tools and extensive network that only Mossy Oak Properties can provide.